The Rude Bachelor: SECRET : Things you never know about CR7 & M10 before ! SECRET : Things you never know about CR7 & M10 before ! It may seem unthinkable now, but had things turned out differently, Cristiano Ronaldo could have been turning out in Barcelona Blaugrana in Tuesday's Copa del Rey Clasico clash, with Lionel Messi in the white of Real Madrid. Cristiano has always maintained that his dream as a youngster was to play for Madrid, yet when he was asked about the possibility of moving to Barcelona in 2010, his answer left many in shock. "You can never say you won't drink from that glass; you never know what can happen in future," he said. Ronaldo signed up at the Santiago Bernabeu in 2009, joining the capital club in a world-record €94 million deal. In the two previous summers, however, Manchester United grew angry at Madrid's heavy-handed tactics in their pursuit of the Portuguese, leading manager Sir Alex Ferguson to claim: "They are a mafia - I wouldn't even sell them a virus." In the meantime, Barcelona watched with interest. Back then, the forward on the left of the Catalans' 4-3-3 was Ronaldinho, the world's best player in 2005 and most of 2006 before a dramatic decline left the club in little doubt that a new star would be needed. With that in mind, Barca's then sporting director, Txiki Begiristain, met with Ronaldo's agent Jorge Mendes in February of 2007 to discuss a possible transfer. In 2008, Barcelona president Joan Laporta was presented with a censure motion following disappointing results on the pitch in 2006-07 and 2007-08, as well as criticism over his leadership style. Had he lost the overall vote, Laporta would have faced elections in July of the same year and one of the men keen to rival the lawyer for Barca's top job was current chief Sandro Rosell. And the latter's election promise would have been to sign a star for the Catalan club: Cristiano. Rosell made his name working for Nike and was key in the signing of Ronaldinho for Barca as Laporta's deputy before the two men fell out, using his contacts in Brazil and with the sporting firm to persuade the forward to move from Paris Saint-Germain in 2004. Nike remain the shirt sponsors for the Catalan club but have been left without a big-name Barca player contracted to their company ever since Ronaldinho departed in 2008. Rosell now hopes to change that by bringing in Neymar, but in 2008 the man he wanted was Ronaldo. By then, of course, Messi was fast winning the hearts of the Blaugrana fans, although it would be later in 2008 and in the subsequent seasons that the Argentine would play his best football for the Camp Nou club, under Pep Guardiola and later Tito Vilanova. Messi made his debut for Barca in October of 2004 and was offered a new contract by the Catalans in May of the following year after an impressive initial campaign. Leo had come through the youth system at La Masia and was happy in Barcelona. He did not think twice and signed the new deal. The agreement, however, was illegal because, as a minor (Messi was still only 17), it needed the signature of the player's father. Furious at the oversight by Barca, unhappy at previous promises broken by the Catalan club in the past and believing they could earn more money elsewhere, Messi's father wondered if his son would be better off at another club and one of Leo's representatives offered the player to Madrid on what would have been a free contract. Florentino Perez, then in his first spell as president at the Santiago Bernabeu, thought long and hard about snapping up one of the world's top teenage talents for free, but feared a colossal conflict with Barcelona and was already wary about such a deal after the ill-feeling created by Madrid's signing of Luis Figo from the Catalan club in 2000. In the end, Barca moved quicky to correct their mistake, a new contract was penned and Messi has been an idol at Camp Nou ever since. While he has led the club to numerous triumphs, smashing scoring records on a regular basis and winning four Ballons d'Or, Cristiano continues to carve his name into Madrid folklore thanks to his incredible goal-a-game ratio and prize performances for the capital club since his move in 2009. 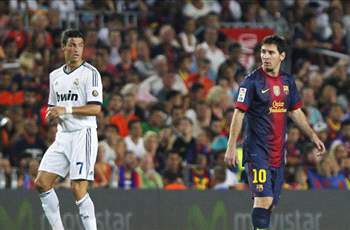 Messi meets Ronaldo again on Tuesday in what promises to be another intriguing installment of the Clasico. 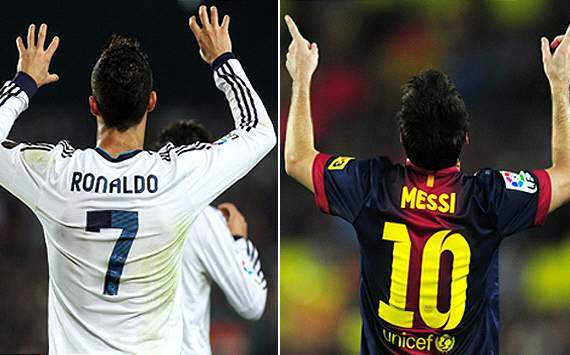 Leo leads Barcelona these days and Cristiano could captain Madrid in the absence of Iker Casillas. It is impossible to imagine things the other way around, yet it could have happened. Not that fans of either side would have it any other way, of course.